The church of St Peter in Besford is a wonderful example of English church architecture and one of only a few timber frame churches in England. 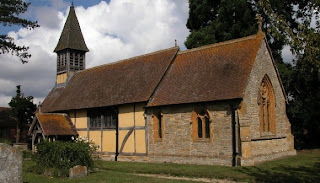 The church is included in Simon Jenkins' England's 1000 Best Churches. It is located on Harewell Lane in Besford, United Kingdom. Inside there are important monuments to the Harewell and Sebright families, as well as pre-Reformation rood screen and Jacobean altar rails. Much more information on the church can be found in ‘Parishes: Besford', A History of the County of Worcester: volume 4 (1924), pp. 19-23 at the following location: http://www.british-history.ac.uk/report.aspx?compid=42848. Photograph copyright Philip Halling and licensed for reuse under this Creative Commons Licence.